Most travel agencies in China have suspended tours to the Philippines amid escalating tension in the South China Sea, Chinese state media say. An official at one agency confirmed the suspension to the BBC, while another said clients were being warned not to travel. The two countries have been locked in a stand-off in disputed waters at the Scarborough Shoal since 8 April. 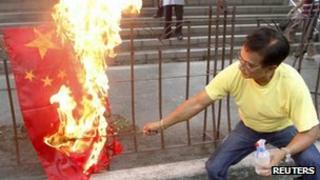 On Tuesday, China warned of a planned protest in Manila on Friday. The Chinese embassy posted an advisory for Chinese citizens in the Philippine capital to stay off the streets and avoid conflict with locals. The demonstration, expected to be attended by some 1,000 people, comes amid heightened tensions between the two nations. China claims sovereignty over a large U-shaped area of the South China Sea, bringing it into dispute with several neighbouring countries. In recent months it has grown more assertive over the issue. Manila has asked China to settle the issue at the International Tribunal on the Law of the Sea (ITLOS). Chinese tourists make up about 9% of total arrivals to the Philippines, said an Associated Press report citing the Philippine Department of Tourism. A staff member at the state-owned China Travel Service told the BBC all tours to the Philippines had been suspended indefinitely following an order from China's National Tourism Administration because of "strong anti-China sentiment" in the Philippines. An agent at Ctrip, one of China's biggest online travel agencies, said clients were being warned against travel to the Manila "for their own safety". China's food safety watchdog has also ordered stepped-up inspections of fruit imports from the Philippines. On Wednesday, Beijing urged Manila not to ''further damage bilateral relations''. The Philippines had ''instigated the Philippine public and Philippine people living overseas to stage demonstrations against China'', Chinese foreign ministry spokesman Hong Lei was reported as saying by Xinhua news agency. These have ''aroused strong responses and concern among Chinese living overseas'', he added. The row began early last month when the Philippines said its naval ship had found eight Chinese fishing vessels at the shoal, which both sides claim. Two Chinese surveillance ships then arrived in the area, placing themselves between the warship and the fishing vessels, preventing the navy from making arrests and allowing the fishing boats to leave. Late last week the Philippines said there were four Chinese surveillance ships and 10 fishing boats in the disputed waters, as well as a Philippine coastguard vessel and a fisheries bureau ship. On Monday, China delivered fresh warnings to the Philippines that it was prepared to respond to ''any escalation'' in the maritime situation. ''China once again urges the Philippine side to seriously respond to China's concerns and return to the right track for handling the matter,'' Vice Foreign Minister Fu Ying said.